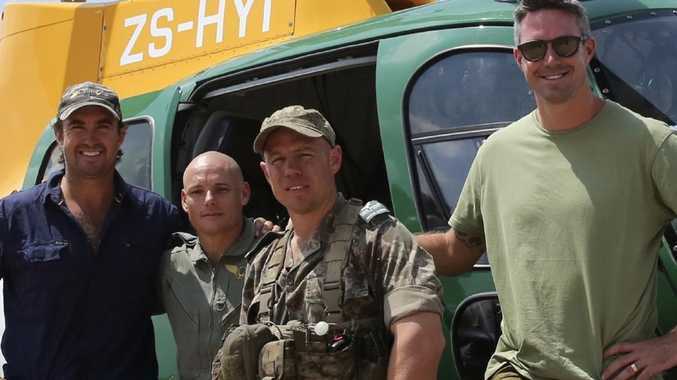 Wright with Pietersen and helicopter crew in South Africa. The top-end TV host and wildlife warrior, who has been compared to Steve Irwin and Bear Grylls, is staying at the colourful cricketer's new digs bordering the Kruger National Park in South Africa. "We've seen rhinos that have been shot and their horns have been hacked off with an axe, for no other reason than greed, which is disturbing and disgusting," Wright said. 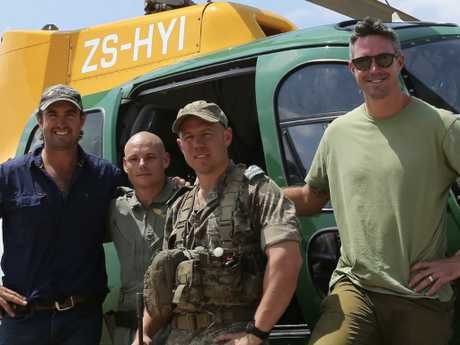 Outback Wrangler Matt Wright has joined forces with South African-born cricket legend Kevin Pietersen for a two-part documentary about rhino poachers in South Africa. "Our series will exposure the destructive activities of poachers." 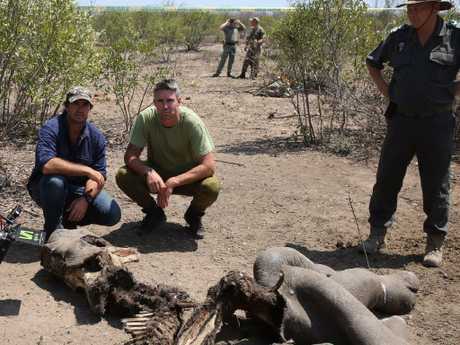 The pair flew by helicopter to the scene of dead rhinoceroses, where they encountered calves with deep gashes on their backs from poachers who didn't want to be bothered while they were removing the adult's horn. 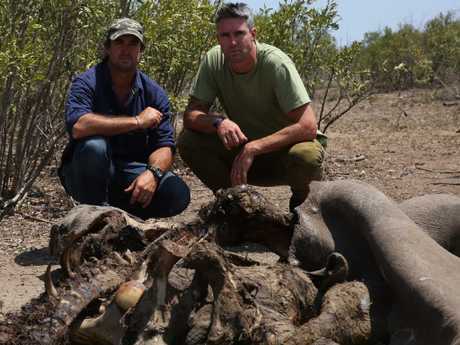 Wright and Pietersen inspect the remains of the dead animals. The world's rhinoceros population is hovering at 25,000 but with three being poached every day, the animal will be extinct by 2025. Pietersen - a 104 test veteran for England - has played the past two seasons for the Melbourne Stars in the Big Bash League with a rhino sticker on the back of his bat, to raise awareness of poaching. 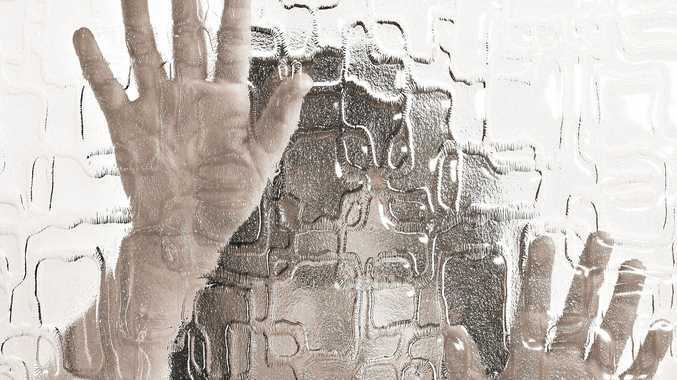 Wright could see elephants and rhinos from Pietersen's new Umganu Lodge on the banks Sabie River, which costs more than $2,200 per night. The documentaries are scheduled for release in Australia, New Zealand, United Kingdom and South Africa ahead of next year's ICC One Day International Cricket World Cup.